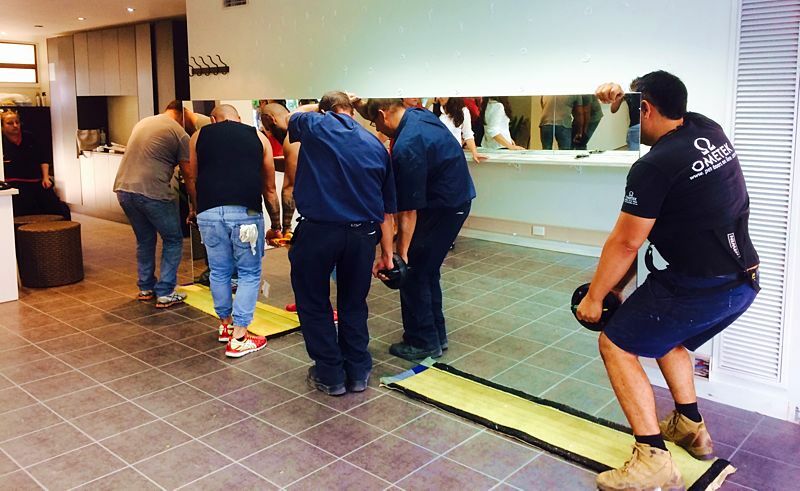 Ometek Glass is a local family business servicing all suburbs of Melbourne for over 20 years. Glazing and glass has been a part of William Omer's family for three generations. The passion for the trade was born when William was a little boy, helping his grandfather in his shop, polishing the edges of the glass tabletops with his little hands. Naturally when settling in Melbourne, establishing his own glass business was a dream realised for this Kurdish refugee. Equipped with his passion and desire to make his grandfather proud, William started his glass business operating from his 2 bedroom unit in West Brunswick. 20 years, and thousands of happy customers, cats, dogs and pet owners later, William is running a professional and thriving business employing a mix of people from different cultural backgrounds and supporting local and international charities such as the RSPCA, UNICEF and Project Compassion. Ometek Glass are very proudly sponsors of the following organisations. 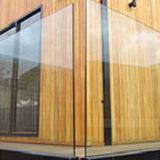 The Ometek team are experts in glazing and glass work. Due to our years of focused experience in this area we are able to confidently complete installations in glass that other pet door installers refuse. There is often no need to replace your entire window or glass door just to install a pet door. Call us to install your pet door on-site, into existing glass walls, doors, windows, and oversize panes of glass. 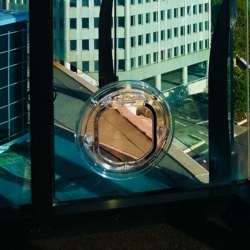 We are one of a select few companies in Melbourne that specialises in the on-site cutting of access holes on laminated safety glass in site up to 12.38mm thick. Many glass companies will advise you to change your glass so they can order the new glass with a hole for the pet door that is made by the supplier, rather than cut the hole directly in your existing glass. Most modern glass is already safety glass, so why change your glass if you already have safety glass? Changing an entire sheet of glass could mean that you are paying unnecessarily for something you already have. The only time glass is changed is if it is hardened or toughened glass as this cannot be cut. A symbol, logo or writing in a corner of your glass will identify it as toughened. Ometek Glass offer the complete service. We can supply and install pet doors for your cat or dog and use only the highest quality pet doors to cater for you pet. Our pet dog doors come in various sizes and can accommodate almost any size of dog or cat, whether it is for a small cat, Chihuahua, Jack Russell up to a German Shepherd, Labrador, Golden Retriever or Grate Dane! We have installed hundreds of pet doors across Melbourne. We are highly skilled and experienced and confident we can meet your needs. Don't forget to update your pet's microchip with your new address and contact information. 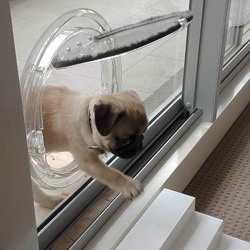 Are you having problems or issues with a recently installed pet door? We can assist in the repair of all pet doors that are under warranty, even if we didn't install or supply it! 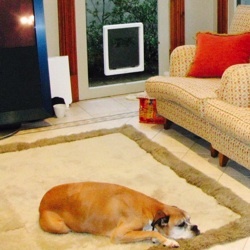 Melbourne wide pet door installers – Specialist doggy door & cat flap installation. We supply & install pet dog & cat doors in sliding glass doors, screen & security or solid doors and walls to fit any sized cat or dog from small to extra large. We are pet lovers just like you and for every pet door we install, $1 is donated to the RSPCA. If you are renting we can install a pet door and when you move out we can replace the glass and re-install the pet door in your new premises. Call us before proceed to include your pet door in your planning. In our experience a lot of people order toughened or double glazed glass and when it comes time to install your pet door, a second piece of glass is required at double the cost. Save yourself time and money and call us first to assist you with your pet access requirements. We specialise in the installation of pet doors in double glazed glass. We also offer replacement parts and can service all pet doors, even those fitted by others! Alot of glass companies will state that you have to change your glass so they can order the new glass with a hole for the pet door that is made by the supplier, rather than cut the hole directly in your existing glass. Alot of modern glass is already safety glass. Why change your glass if you already have safety glass? Changing an entire sheet of glass means painting beads, replacing silicone, cleaning up mess and paying unnecessarily for something you already have. The only time glass is changed if it is hardened or toughenned glass as this cannot be cut. A symbol or logo or writing in a corner of your glass will identify it as toughened. Are you having problems or issues with a recently installed pet door? We can assist in the repair of all pet doors that are under warranty, even if we didn't install or supply it! Ometek Glass offer the complete service. We can supply and install pet doors for your cat or dog. We use only the highest quality pet doors to cater for your pet. Our pet dog doors come in various sizes and can accommodate almost any size of dog or cat, whether it is for a small cat, a Chihuahua or a Jack Russell up to a German Shepard or Labrador or Golden Retriever. We have installed hundreds of pet doors across Melbourne, are highly skilled and experienced and confident we can meet your needs. I am very pleased with both my mirrored splashback and cat door supplied and installed by William. He did a great job and was very focused in making sure the finished product was to an excellent standard. Thanks William - I have no hesitation in recommending. Highly recommended! William did an excellent job installing a cat door through our window. Thanks so much Ometek! William was able to deliver glass cut to measure for our dining table on Christmas Eve with 2 days notice! Great service and lovely guy. Happy to recommend. Fantastic workmanship, very professional and amazing service. 100% recommendation. William did a great job installing a Transcat dog door for us in our laundry door, he was very up front about his cost, showed us a schedule of the costs according to the thickness of the glass cut. He was professional and friendly. We were very happy with his service, we called him back again to install another dog door in our family room. Would highly recommend him if you need a dog door installed. Need a room in your house or your whole house painted? Call Ometek Painting for a quote! Call our affiliated painting company Ometek Painting for a quote for all of your domestic and commercial painting requirements - Master painters in Melbourne offering local prices and free quotes for interior & exterior commercial and house painting services throughout Melbourne. 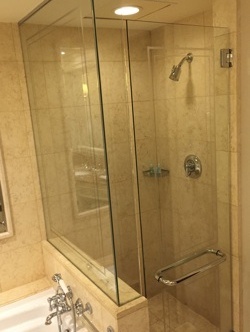 We are also general glaziers & glass repair specialists - broken window repairers and supply, install and replacement of frameless sliding glass shower screens, splash backs cut to size, custom mirror installation. Ometek Glass uses only the highest quality glass and optic mirrors - made locally in Australia by Pilkington. Mirrors supplied by Ometek are brighter and better quality than other inferior imported products. Mirrors can be cut to size, framed, polished, beveled or brilliant cut. Should you wish to order a mirror and install yourself, Ometek is happy to cut the glass to size and deliver free to your door. We offer a 24 hours a day, 7 days a week shutter and security service to secure your premises in the event of breakage. Ometek offer this shutter service to commercial, industrial and domestic customers to all suburbs of Melbourne. We specialise in providing a same day service for shop front replacements. We understand the importance of ensuring business continuity to small businesses and provide same day service on shop front replacements. Ometek Glass are experienced in performing all types of insurance work for shutter, security service and shop front replacement. 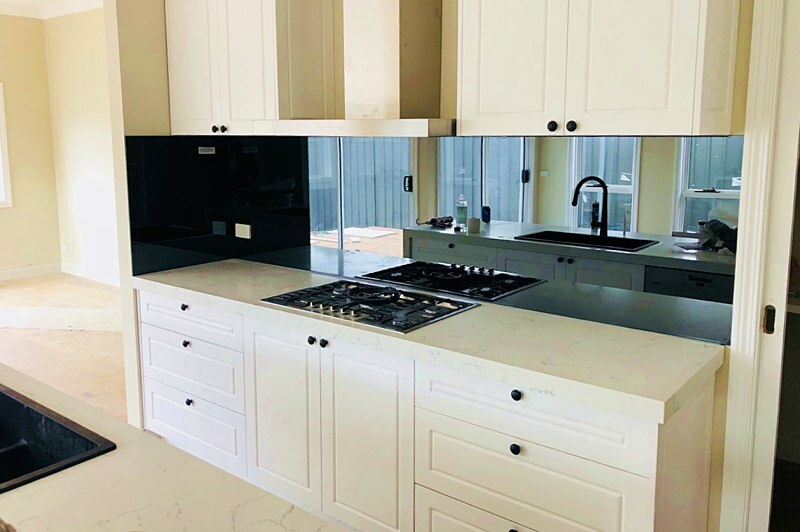 We also supply and install mirrors, kitchen and bathroom splash backs, frameless and semi-frameless shower screens, glass table tops, skylights and general glazing work for residential customers and project and building trades clients. We pride ourselves on our attention to detail and ensuring the satisfaction of our customers. 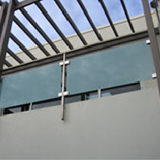 Ometek Glass offers same day service to the all suburbs of Melbourne 7 days a week. 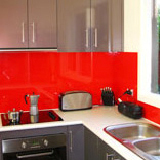 Ometek Glass provides the most comprehensive range of glass kitchen splashbacks, and offer a personalised one-on-one service with prompt turnaround times. We use and recommend only the highest fittings and components to provideservice and advice to consumers, desginers an architects. Perfect your kitchen, laundry or bathroom, and other areas such as offices or reception/entrance areas. Ometek Glass provides a comprehensive range of frameless, fully framed and semi frameless shower screens from a wide variety of suppliers. There isn't an application we haven't provided a solution for. Modernise the look of your bathroom by doing away with your old and tired sliding aluminum framed shower screen. 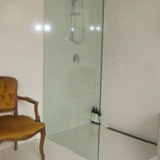 You can't go past the sleek and minimal look of a frameless or semi frameless glass shower screen. 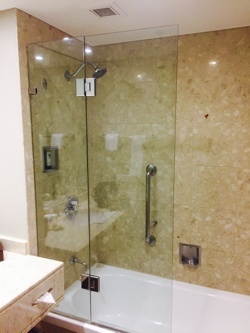 It is often more cost effective to update and modernise the look of a bathroom quickly and easily with a frameless shower screen, rather than renovating the entire bathroom. 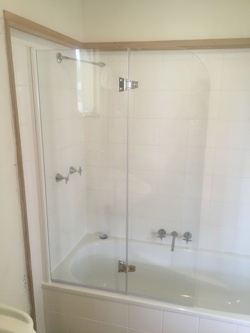 Ometek Glass have extensive expertise providing shower screen replacement work for insurance claims where bathroom damage involving splash backs, shower screens, skylights or mirrors has occurred. We pride ourselves on our high levels of customer service and attention to detail. Ometek Glass are experienced in performing all types of insurance work including shutter and security service and shop front replacement. We also replace and repair broken mirrors, kitchen and bathroom splash backs, frameless and semi-frameless shower screens, glass table tops, skylights and general glazing work for residential customers and project/building trade clients. Call us now for a no obligation free quote or to discuss your project. We are happy to discuss your requirements and provide assistance or guidance as needed.